this apple pie with cidre is really delightful. 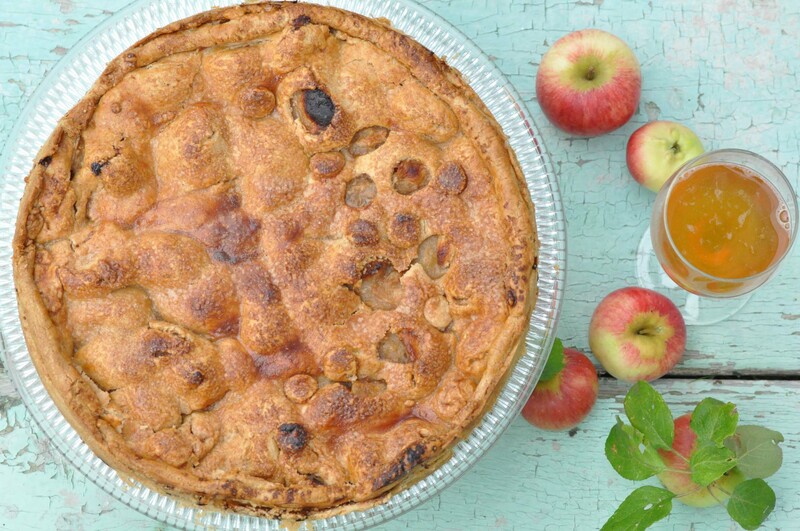 i found the recipe, the very lovely story behind the apple pie and one of the most beautiful food photos on the blog photisserie. you may already recognize that i really love this blog and that´s why i couldn’t resist to make this apple pie in addition to the fact that we finally harvested our first own apples this year. our apples (prince albrecht of prussia) turned out to be the perfect choice for this pie as they became almost an apple sauce under the crusty crunchy pastry. the apple sauce inside is a perfect balance between sweet and sour with a touch of cinnamon. and it looks phantastic and there are no limitations to your creativity to decorate the pie to your liking. peel the apples and cut into pieces. put the apples together with some brown sugar (amount depends on how sweet or sour your apples are), cinnamon and the cidre in a large bowl. cover and let it soak in the fridge for at least one hour. combine a pinch of salt and flour. add the butter, cut into small pieces, and knead with your fingers until combined to a kind of crumbles. add the water and now knead until you got a compact pastry. wrap in clingfilm and let it also rest in the fridge for one hour. divide the pastry into two pieces. roll out the first piece and place in a buttered cake tin. drain the soaked apples, add two tbsp of flour and combine. pour in the cake tin and cover with the second rolled piece of pastry. cut some wholes in the pastry to allow the heat and steam to evaporate while baking and decorate with the cut out pieces. or you also can plait the pastry to cover your pie, if you can. let the pie rest in the fridge for another 20 minutes. preheat the oven to 190° C.
brush the pie with the whisked egg and sprinkle over some more brown sugar. bake for about 50 minutes until golden and crunchy. serve still warm together with a glass of cidre if you like. i also did the pie with austrian apple cider (most) and it worked excellent as well. äpfel schälen und in stücke schneiden. zusammen mit dem braunen zucker (die menge hängt davon ab, wie sauer die äpfel sind), zimt und cidre in eine große schüssel geben und etwa eine stunde kalt stellen. in einer zweiten schüssel eine prise salz mit dem weizenmehl und dem roggenmehl mischen. die butter in stücken schneiden und mit hilfe der hände mit dem mehl verkneten. wasser zufügen und einen teig daraus kneten. in frischhaltefolie wickeln und ebenfalls eine stunde in den kühlschrank legen. den teig in zwei gleich große stücke teilen. den ersten ausrollen und in eine gebutterte kuchenform legen. die apfelstücken aus dem kühlschrank holen, abtropfen lassen und mit zwei esslöffeln mehl vermischen und dann in die kuchenform auf den teig geben. die zweite teighälfte ebenfalls ausrollen und über die äpfel decken. einige löcher in die teigdecke stechen, damit der heiße dampf während des backens entweichen kann. die ausgestochenen stücke können zur dekoration verwendet werden. wer kann, kann den kuchen auch mit geflochtenem teig abdecken. den kuchen noch mal 20 minuten im kühlschrank ruhen lassen. währenddessen den ofen auf 190° C vorheizen. das ei verschlagen und den kuchen damit einstreichen. etwas braunen zucker darüber streuen. 50 minuten backen, bis der kuchen braun und knusprig ist. noch warm mit einem glas cidre servieren. ich habe den kuchen auch schon mit österreichischem apfelmost gebacken, das funktioniert auch ganz wunderbar. This entry was posted in autumn, recipes and tagged apple, pie, sweets by The Cook. Bookmark the permalink.